Announced only days ago, Premium Bandai has just updated their order page for the Complete Selection Modification New Den-O Belt with official images and release info! The CSM New Den-O Belt is the first Den-O related entry in this high end replica line in over 8 years. And it looks like they pulled out all the stops for this one. Not only can this belt be used for New Den-O’s standard Strike Form, but it can also assume Vega Form! Strike Form brings with it a wealth of voice clips from New Den-O’s Imagin, Teddy. While the briefly used Vega Form mode brings voice clips of Deneb from when he possessed New Den-O in the Decade crossover film. In all, this belt includes more than 50 sounds & voice clips! New Den-O’s Belt also includes his Rider Pass, Teddy’s Rider Ticket, & a blank New Den-O Ticket. The CSM New Den-O Belt retails for 14,040 yen and will be released as a Premium Bandai exclusive in May 2017. And the next CSM release has been officially announced! If you can’t tell from my initial excitement, this one is very near and dear to me in particular. Up next for Premium Bandai’s exclusive high end role play line is the Complete Selection Modification New Den-O Belt! The original CSM Den-O Belt was actually released way back in 2008. So it’s taken quite a long time for Kotaro/New Den-O to finally receive his. In the near future Premium Bandai will be updating their website with more information on this exciting release. We’ll be sure to to keep you up to date when they do! 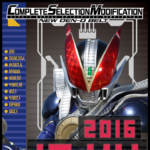 Revealed last week, we’ve finally gotten confirmed release information for the Complete Selection Modification Decadriver! However some of this information may hurt collector’s wallets. On one hand the Decadriver itself will retail for 12,960 yen, scheduled for release in February 2015. However, despite initial speculation, it appears the Rider Cards are sold separately. 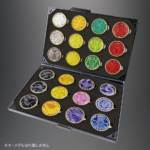 That’s right, Also being released in February 2015 for 7,560 yen is what appears to be a “complete” set of Rider Cards. It would seem these cards will be similar to previous premium card archive sets released for other rider shows. The price suggests this will be an extensive collection of cards, possibly including ALL of Decades’ cards used throughout his various show & film appearances. 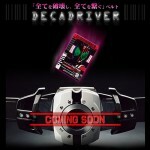 More details will be released by Bandai for both the Deacdriver & Rider Cards set October 24th. Walking the path of heaven, the company that will rule our wallets put up a new video demonstrating the latest offering in the Complete Selection Modification series- the Kabuto Zector! This video demonstrates that the CSM Zector will have working “Clock Up!” pads (a feature neglected in previous releases) and confirms the belt size is meant for 100-centimeter waists. Orders for the Complete Selection Kabuto Zector will be open until June 9th and the official release is set for September! The cost is 12960 Yen before shipping and middleman fees. Orders for this CSM Zector will be open from March through June 2014 and will be available beginning September 2014. The Zector will cost 12,960 Yen before shipping!